Design and development is quick too so your idea could be a reality faster than you think. Designed and built in their UK workshop ‘Bespoke’ builds are really no problem, in fact they enjoy the challenge. If you can think it, they can make it! Solotec HEPA cabinets - simply the best for most applications in today’s busy laboratories and taking up a minimum of room too. All models (except AS300) are now fitted with a low noise variable speed fan that draws air through Solotec's trusted 300 series H14 HEPA filter before returning it to the lab. The BH550 (previously WS110) is a dual purpose extraction hood that protecting personnel from nuisance media powders and the balance from turbulence. 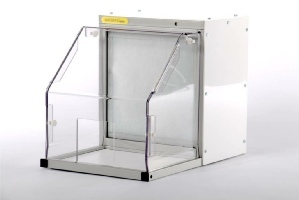 The standalone unit is designed to easily fit onto most benchtops and is ideally suited for those in-between applications which are too small to necessitate a fume cupboard but benefit from improved containment. It has very low air flow (20m3/h) and can be user configured. 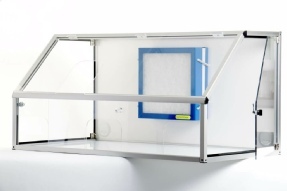 The Analytical front panel has a clear acrylic lift off front panel with arm access holes at the bottom. Usually chosen for use with analytical balances. The Top Pan front panel has a clear acrylic lift off front panel with arm access holes halfway up the sides. Usually chosen for use with Top Pan balances. At 640mm wide the SA640 (previously Waysafe® 2) has ample space for most types of microscopes, yet is still small enough to fit on a standard benchtop. The front panel is easily removed to provide access to the interior for the placing and positioning of equipment. The lower panel has two hand holes for operator access. 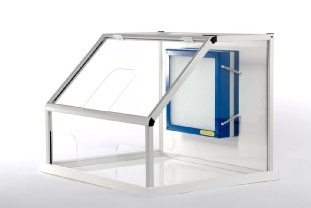 At 1000mm wide the SA1000 gives ample space for both sample preparation and microscopy in the enclosure. The reversible front panel allows left or right microscope positioning and the lower panel has three hand holes for operator access. Full sized side opening doors offer access for media loading and cleaning. The Waysafe® AS300 (previously Minicab), prevents passive inhalation and allows safe testing and metering of spray delivery systems in production, laboratory and clinical environments. 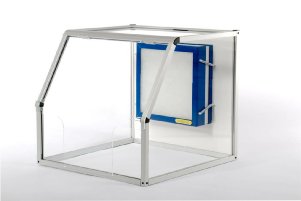 The small footprint unit has relatively high airflow so users can be sure that the sprayed media is captured inside the enclosure before passing into the HEPA filter. Clean filtered air is the circulated back into the workplace through the rear grill. 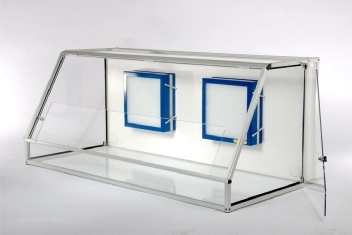 The perspex hood allows clear viewing of the sprayed media and the HEPA 300 and G4 pre-filter does the rest. 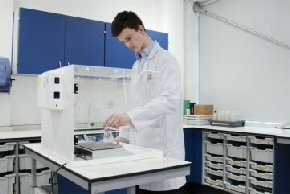 The GP540 (previously Waysafe® 3) is a general purpose hood which has many uses within the laboratory. A low noise 2 speed fan draws air through our trusted 300 series H14 HEPA filter before returning it to the lab. The front panel can be easily removed which provides open access to the interior. The base is open to allow easy positioning over fixed or heavy equipment. Designed for media powder mixing and weighing, the GP 1200 solves the problem of personnel exposed to particles in or near the mixing room and effectively removes the need for operators to wear face masks. Now part of the ‘GP’ general purpose range, it has found numerous uses in laboratories and production environments around the world. Side entry doors and a removable front panel afford easy access for media or equipment loading and cleaning. Operator access is through the front panel opening which we can modify to suit your application at no extra cost using the latest laser cutting technology. Two Waysafe® ‘300’ series HEPA filter/fan units provide background airflow that ensures operator protection without affecting sensitive instruments or operations.